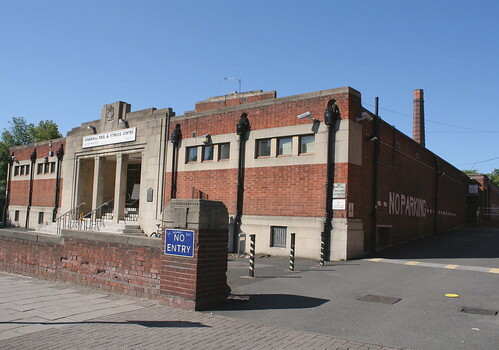 A public meeting to detail progress and gauge opinion on the redevelopment of Sparkhill Baths takes place next Tuesday, July 26th (7pm) at Sparkhill Cultural Centre, Stratford Road (next door to the existing baths building). The meeting is organised by the Save Our Swimming campaign group and the panel will include Councillor Martin Mullaney, Birmingham City Council Cabinet member for Leisure, Sport and Culture. Sparkhill Pool and Fitness Centre closed in July 2008 following the discovery of asbestos in the swimming pool hall, but a surveyor’s report subsequently uncovered serious structural problems and, following a public consultation process in spring 2010, a decision was taken to demolish the existing structure, which dates from 1931 and is locally listed Grade ‘B’, and build a replacement along similar lines to that currently being erected in Harborne. A recent Hall Green Constituency meeting agreed to support proposals taken by the Council Cabinet to hand the running of the new facility to the private sector, although the building would remain publicly owned (a similar arrangement will be implemented at Harborne when that facility opens in late 2011 or early 2012). Local councillors, council officers and Hall Green MP Roger Godsiff have all been invited to attend but with the new building not expected to open until 2014 at the earliest, and the detailed design and specification still to be determined, there remains plenty of scope for public input.